Born on the Navy circuit, moving every 2 years. Home was an elusive concept at best. As life would have it we occasionally doubled back and that place was San Diego. Living there in the’ 60s and ’70s was a magical experience. Simple, clean, fun, and just right for starting my love affair with the ocean. 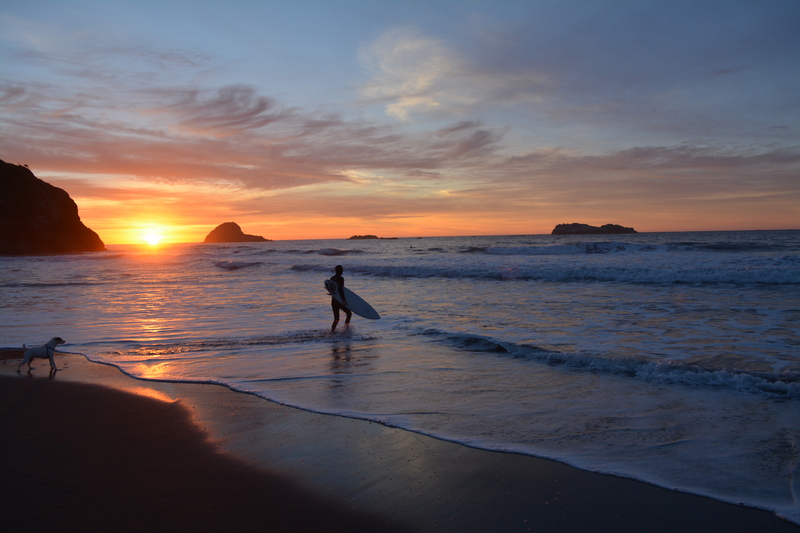 What better place to start surfing? To wake up every morning and head down to the beach and enjoy the surf. Out before dawn, quiet, the ocean like glass, nice swell, slight offshore breeze, just a few friends. Hooting as we took turns. Law Street, Diamond Street, PB Pier, this was my life. The smell of the surf in the air — salt & kelp — feeling the tides, the excitement when there was a swell, everyone smiling. Totally in sync with the ocean. Got better, tackled Hairmos, Windansea, Big Rock, Blacks, Baja. Surf City. King of the world! I didn’t need anything else. 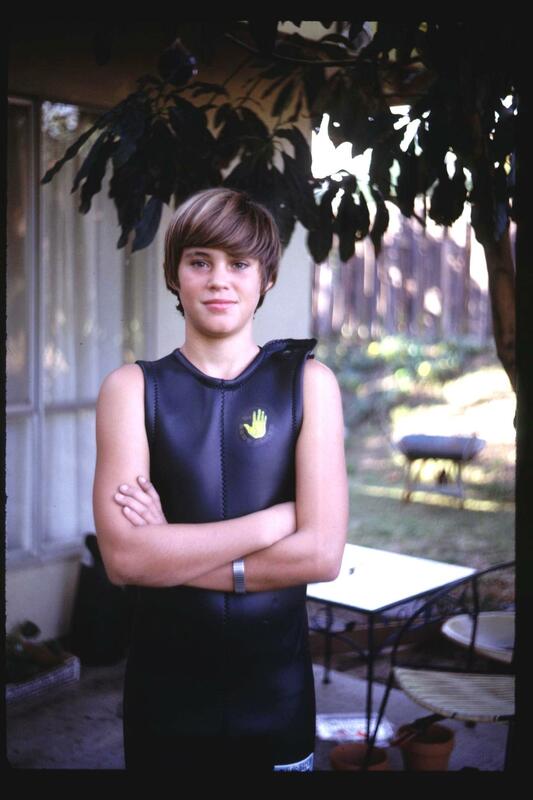 PB in 1970, in my backyard. Photo: Gene Tissot. But I didn’t know what was coming. Time to move. My heart ripped out. Move to the Bay area: Alameda. Where the hell was I? In hindsight this was exactly what I needed to do. Move on, get perspective. At the time it was a nightmare. 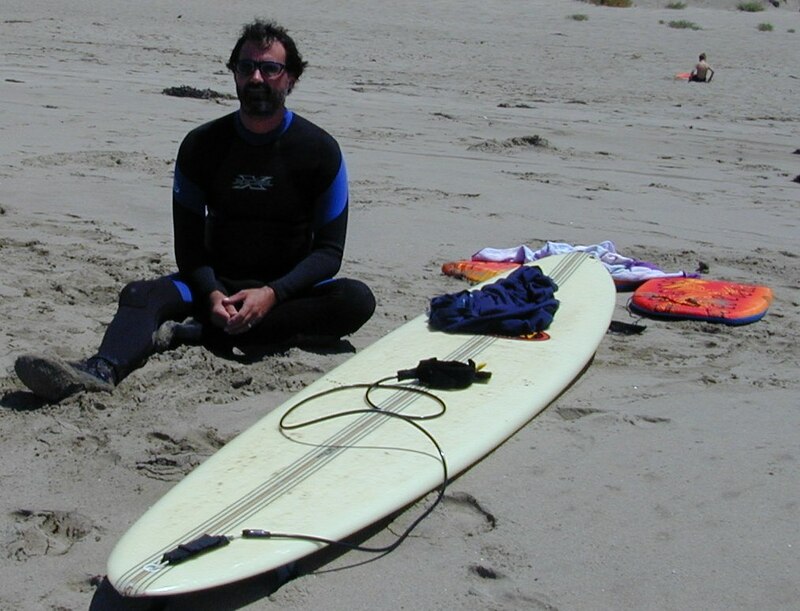 I missed surfing, the intimacy with the ocean, my first surfer girlfriend, Melanie. For months, years, I wrote letters, drew surfing stories and wrote amazing adventures. Life moved on. Rockaway Beach, CA, 1973. From right: Sam George, Jeff Chamberlain, Brad Chamberlain, me. Photo: Self timer. The bay area in 1973 was alive, happening. Santana, Humble Pie, Grand Funk. 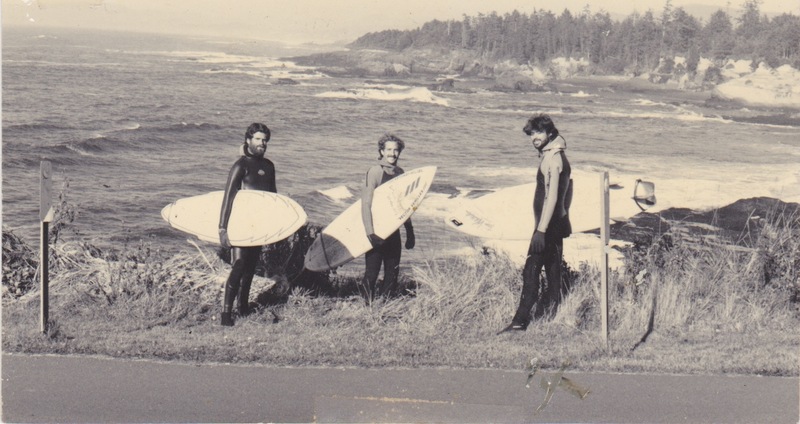 I eventually met some great surfers, legends. Jeff Chamberlain, Sam George, Matt George. 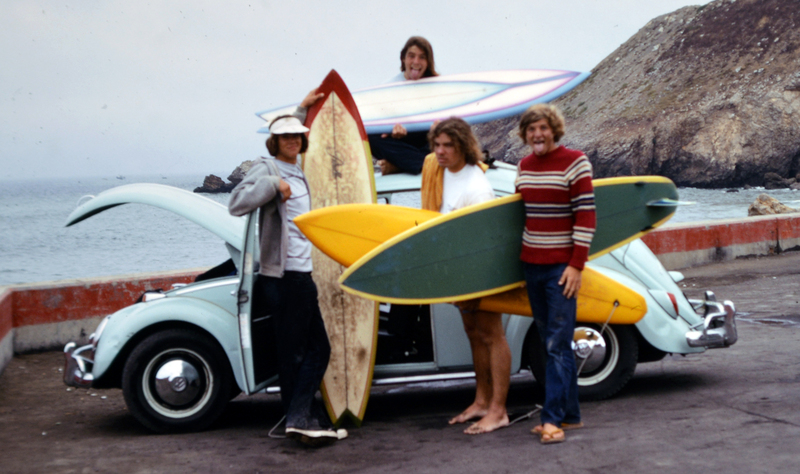 We pioneered Fort Point, surfed every spot between SF and Santa Cruz, up to Bodega Bay, down to Big Sur, and beyond. I reconnected but it wasn’t San Diego. Then another move. Ripped again from a new equilibrium to something else. East coast: Ocean City, Hatteras, Sebastian Inlet, one year to reconnect. Great times but no dice. 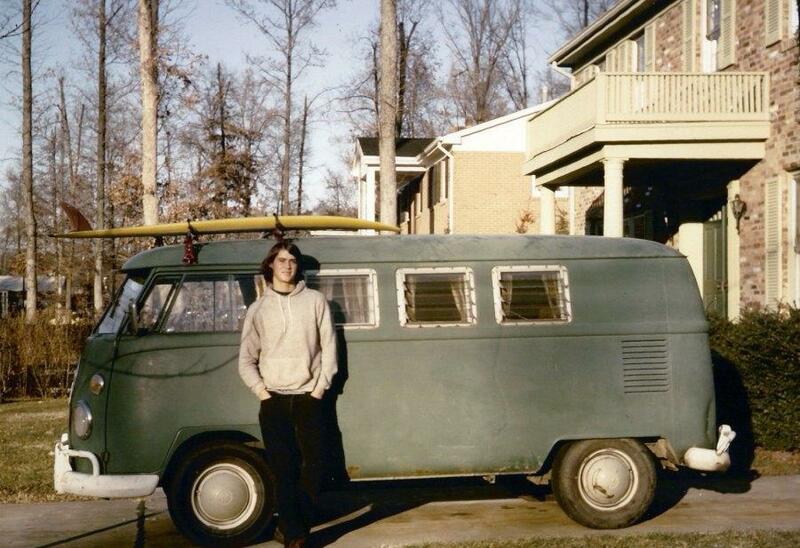 Virginia, 1974. Photo: Gene Tissot. Then on to college at Cal Poly. For awhile life was great, wonderful: Shell Beach, Hazards, Morro Bay, Moonstone Beach. Connected with marine biology, life was good. Six years of an amazing place but I had to move on, was now driven. Then, graduate school: Laguna Beach, Corvallis, Newport. Marriage. Professor. Move to Hawaii, two kids, to Washington State, 20 wonderful years go by. Life is great, happy, but I am not home. Something is missing but I don’t know what it is. Life is good but I feel lost inside. At night I dream endlessly of those early days surfing PB. Out in the water before sunrise with just a few friends, flat calm, nice swell, offshore breeze. The sun comes up, pure joy. Oregon 1986. With (from left) Dave Booth and Mark Hixon. Photo: unknown. I go back. In the ’70s, ’80s,’ 90s, ’00s I return to San Diego, to PB, to Crystal Pier. Not the same. Not the place I knew. Something had changed but I was’t sure what. More crowded for sure but also . . . different. Even the surf had changed. Maybe it’s me. Alas, can’t go back. Time to move on. My mother defined home to me, always made us feel settled, wherever we were. She used to take my brother and I surfing in PB befores we could drive and sit in the car while we surfed, for hours, even though she worried endlessly about us. A true sacrifice because she knew we loved it. Without her during those early years I don’t know what I would have done. But then she passed and I had to find my own way forward. In my mid-50s now. Feeling the tug of the last good decades. Kids getting older and leaving home. Pajaro Dunes summer surfing, 2002. Photo: Susan Tissot. My wife and I look around for a new home. Lots of opportunities, many paths. Two years of chaos but I feel channeled and a tug of destiny. Then, at the last minute a job at Humboldt in northern California. A place I have thought of often but was always just passing through. Apply, interview, job offer, take it. It felt like home. Move. It was simple, clean, fun. The same waves that I remembered at PB but with a gorgeous coast, redwoods down to the water, majestic cliffs and endless beaches. That same smell of the sea, feeling the tides, watching the rise and fall of the swells. Waves everywhere. Nice surf crowd, smiling faces, I felt welcomed. After a life of wandering I had returned. What a wonderful world! What a gift. I am home. Very well written Brian. Good work and I am glad you are “home”! As you are a marine biologist, I assume you know what you are talking about. However, are abalone really snails? That is so gross. Friends used to bring us abalone and we loved it. Kept the big, beautiful shells.